Those of us old enough to remember Lynda Carter as Wonder Woman will know that phrase. If this Goddess card is chosen quiet, unobtrusive honesty and determination will be necessary in order to bring about the desired result. 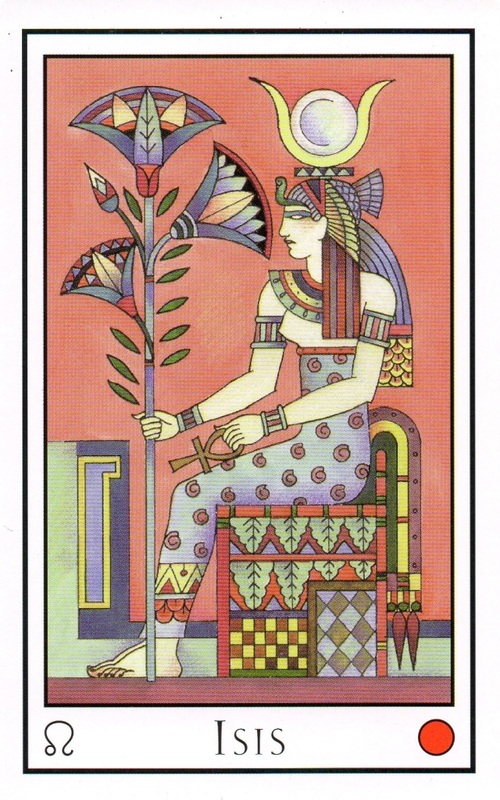 Isis is a Red goddess and represents the dignity and authority of a ruler. She urges you to take responsibility and lead the way to the solution of the matter in question. I’m not overly familiar with Egyptian mythology, beyond knowing the names of some of the gods and goddesses. I’ve never been captivated by ancient Egypt to the extent some people are so I still have a great deal to learn about Isis. What I’ve learned so far is she is one of the more approachable, people-oriented goddesses. Isis was the daughter of Geb, the earth god, and Nut, sky goddess. Like so many other ancient gods and goddesses, she and her brother Osiris were married. While Osiris was off doing his thing, Isis would step in and kind of keep things running. She also taught the arts of spinning and weaving, how to grind flour, and rudimentary (herbal) medicine to the people. She is credited with introducing the idea of marriage to stabilize relationships between men and women. She is also the goddess of motherhood, and magic. And as with most ancient deities, the myths about her are not all consistent. Even the pronunciation of her name is uncertain, and scholars apparently came up with one at random (ancient Egyptian had no vowels, which makes it tricky to guess how something was spoken), but a reliable literal translation of her name is “She of the Throne” indicating her status as a ruler. It seems she could do it all. Is this helping me get any writing done? Not exactly, but it’s distracting me from other things I don’t want to think about, and that’s good. I think any time you spent educating yourself is helping your writing: now two of us know a little more about Egyption mythology than we did this morning. Plus in mjblog mythology, spinning/weaving = spinning stories and weaving tales, so basically we are just doing homage to a patron(ess) saint. It is interesting, and I like the spinning/weaving connection. After all, someone had to spin stories about the gods and goddesses to begin with. I’ve just never been one to go nuts over all things Egyptian. Ancient Egypt and Cleopatra and King Tut have been so over-romanticized that I was burned out on it without ever having studied it. Over the last few years I’ve been more focused on the myths of my own ancestors in Scandinavia and Ireland, which are largely neglected in favor of the Greek, Roman, and Egyptian pantheons. I kind of read about Egypt grudgingly. Isis (or probably more correctly Aset) is like a proto-goddess, and precursor to others that came later so I can’t neglect her forever. True 🙂 Their vision of the afterlife, however, leaves much to be desired. From what I know of it, whatever social ranking you held in this life, you will hold in the next. So if you’re a peasant or slave in this world, that’s what awaits you after death. I’m signing up for Ragnarok, it sounds better, even though the gods are fated to lose. At least I can go down swinging. As someone who has always been deeply stuck in the lure of Egypt, the matching of Isis with Leo is a rather unique idea. It focuses on a completely different aspect of Isis than what is normally preferred in tarot and oracle decks (Empress/HP/mother). That was my first thought. I see Isis more as the High Priestess. Perhaps they chose Isis for Leo due to her queenly attributes. Hehehe… erm… I mean ROOOAAARRR! It’s stunning, I love Smith’s art. Unfortunately the Web sites listed in the back of the book don’t appear to be up anymore (http://www.luna.clara.net/moon/index.htm) but I’m sure there are plenty of sites with more of the cards pictured. I’ll be happy to put more up as I work through the deck. Their new website – elementaltarot.com – shows all the cards in a slideshow. They’re small, but big enough to make me all jealous-like 😉 While searching for images, I found the Mystic Meg tarot, which also appears to be illustrated by Caroline Smith. Too bad the pips are non-scenic. Oooo, thanks! (it’s loading, torturously slowly on dial-up). I found my copy on EBay, didn’t have the original box, but it did come with an interesting bag. Yeah :::scratching chin::: not sure how that got added into the deal, but it’s a decent little bag. I wonder if it was intended to be reminiscent of the eye of Horus symbol? Definitely, dust that puppy off! You never know what you might want to do with it now, with fresh eyes.